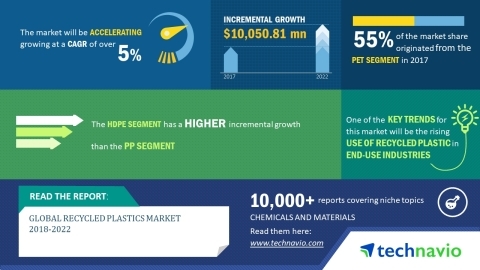 Technavio’s latest market research report on the global recycled plastics market provides an analysis of the most important trends expected to impact the market outlook from 2018-2022. According to Technavio analysts, the global recycled plastics market will grow at a CAGR of over 5% during the forecast period. Favorable regulations on the use of recycled plastics by end-user industries drive the global recycled plastics market at a steady rate. A food safety authority published a scientific opinion on the safety assessment of two recycling processes used for recycling HDPE plastic bottles for use as food contact material. According to the European Commission, all plastic packaging in the European Union market will be reduced. This will lead to a decline in the usage of single-use plastics and the international use of microplastics will be restricted. The growing focus on using sustainable alternatives to plastics increases the demand for recycled plastics at a stable rate. Recycled plastic is extensively used as a substitute for aluminum and steel. Most plastics are made from petroleum or natural gas, which are non-renewable resources, and affect the environment adversely. “The pollution caused by the plastic landfills and incineration poses serious hazards to the wildlife, plants, and humans. Recycling reduces the threat of global warming, reduces ozone layer depletion, and maintains the ecological imbalance,” says a senior analyst at Technavio for research on specialty chemicals. This market research report segments the global recycled plastics market into the following product types (PET, HDPE, PP, and LDPE), end users (non-food contact packaging, food contact packaging, construction, and automotive), and key regions (the Americas, APAC, and EMEA). The PET segment held the largest market share in 2017, accounting for nearly 55% of the market. The market share for this product type is expected to increase by 2022. The fastest growing product type is HDPE, which will account for nearly 33% of the total market share by 2022. The Americas was the leading region for the global recycled plastics market in 2017, accounting for a market share of nearly 52%. By 2022, The Americas is expected to continue dominating the market and register the highest growth.